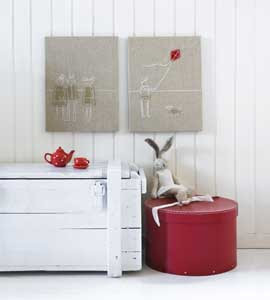 Lots of projects from Dutch magazine ariadne at Home. Most with PDF pattern downloads. Sewing, decor, felt baby shoes, papercrafts and more. There was one idea for embellishing an Ikea tablecloth with teacup pictures using t-shirt transfer paper and then stitching around the design. I couldn't help but think that some of the images from the earthenware collection I recently mentioned would work great. Scroll through the collection, click on a project you like, then click "Lees Verder" on the page that comes up. The PDF links are often at the bottom of the project page. Have fun. Diane is showing her new Spoonflower fabric on CraftyPod. Her beautiful design was created with the Zefrank Flower Maker. I love a cool online design tool. 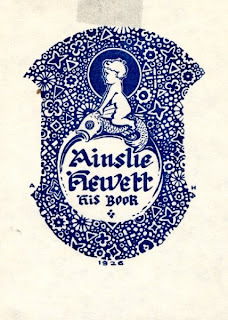 The Ainslie Hewett Bookplate Collection features 104 bookplates designed by Louisville native (George) Ainslie Hewett between 1909 and 1951. Hosted by the University of Louisville. Another method at esprit cabane. The Old Professor has finally been properly recognized in print. He's had a short story published -- a very short story. Dang, he makes me laugh. See his post. Today is the 6th day of drilling. 340 ft. drilled and cased and still no water. We were hoping for better but this isn't a surprise. 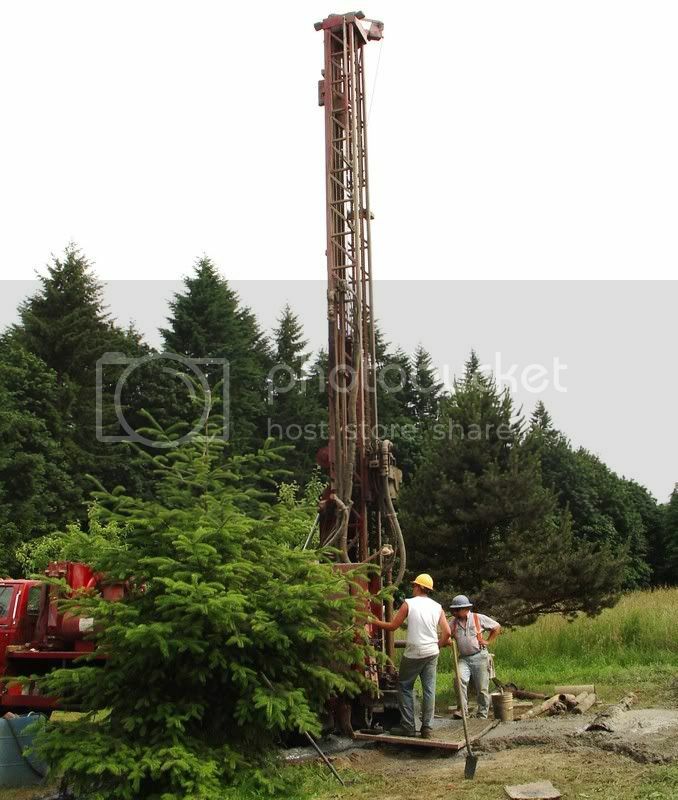 Our property is on a hill and the drill site is at the highest point. June asked how the drillers know where to drill. 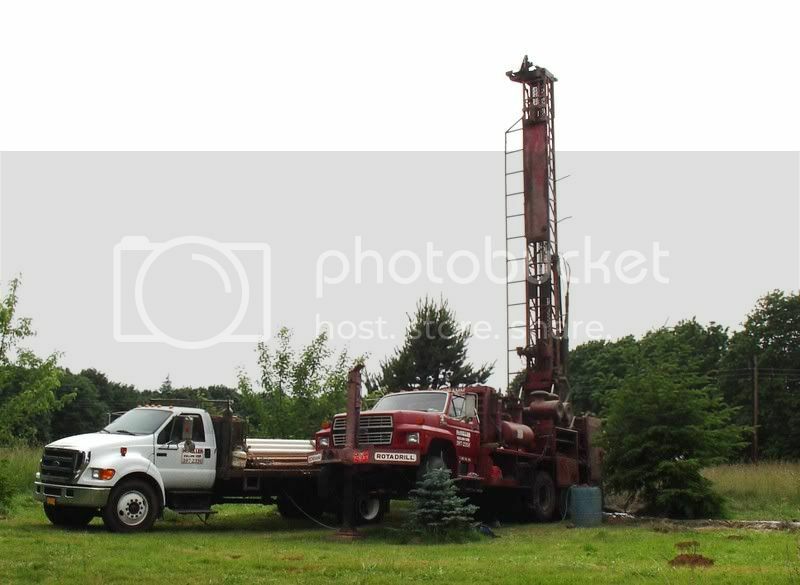 In our case there are a number of factors such as where the equipment is able to be located, where the septic system is and how far from the house to trench and install pipe and electricity. 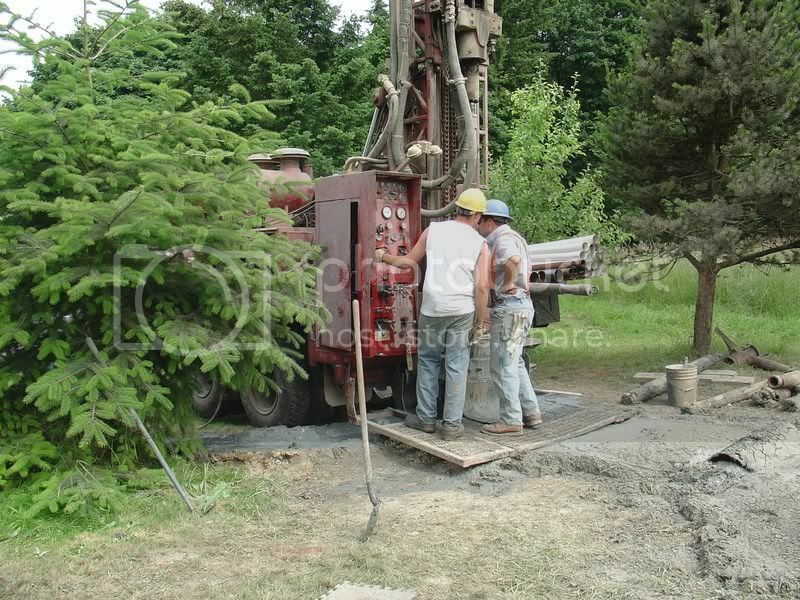 We have to rely on the driller's experience and knowledge of the geology. Our house is located at the top of the hill and the septic is on the downside of the house. Our current well is at the bottom of the hill and is very shallow, old and has magnesium dirty water requiring a number of filters. We knew this when we purchased the property for the cost of land only. This well has two pumps to get water up here and when the electricity is out so is the water. Our goal is quality water and a storage tank so we have gravity feed to the house when the power goes out. These pictures were taken last Friday. 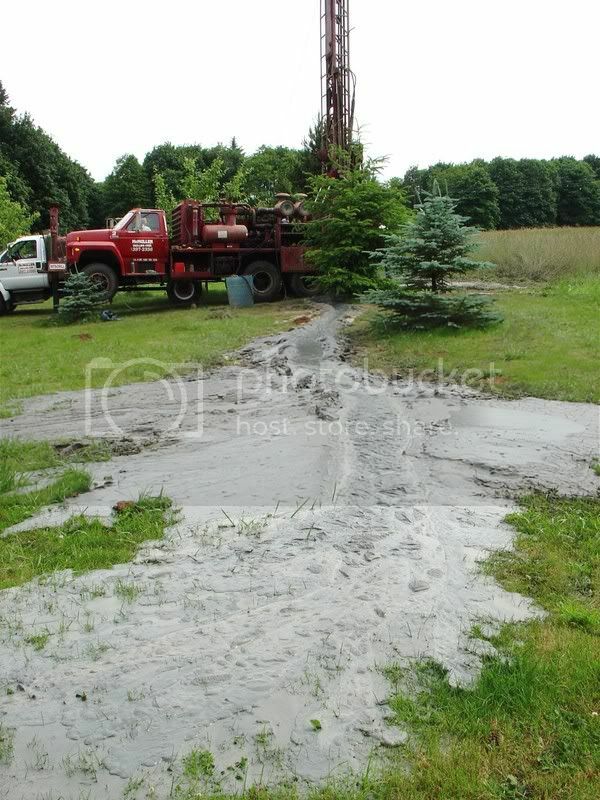 The driller told us he was through the clay layer and was starting to hit sandstone and rock. We need rock layers. So far there had been a river of grey clay and a smooth sound to the drill. This morning the clay has changed to tan color and I can hear the drill start to bounce. That's the sound of rock but so far it hasn't been constant. 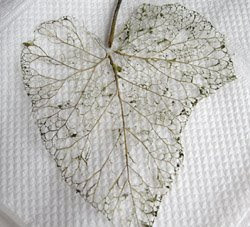 Patty aka Pip Stitch has posted tons of links to stitching fun. Here are just two but you should visit her blog to explore in depth. Be sure to browse her freebie finds. 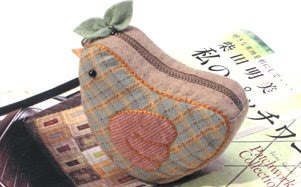 This cute bird coin purse from Tiny Garden. Pattern here. Tiny Garden also offers lots of embroidery patterns so do check through the list of downloads. for creating your own text into stitching charts. Patricia posted a link on Agence Eureka to a huge collection of Dutch ceramics in the Memory of the Netherlands hosted by the Koninklijke Bibliotheek. Design inspiration that goes beyond ceramics for me. Recent posts on Agence Eureka have vintage paper cutouts and some wonderful decorative lettering. Patricia is simply one of my favorite bloggers. Arounna Khounnoraj is a weekly guest at BloesemKids, showing us some great art projects you can do with your kids. I'm so sorry that posting has been slow. It hasn't been raining so outdoor projects and cleanup are underway around here. Yesterday the water well drillers started on a new well. We have put this project off for far too long and I have hopes for quality water with a high flow rate. This is a scary proposition for a person like me. I like a sure thing and drilling for water is not that at all. As soon as I have anything to share I will but for this moment I had better get dressed before the drillers show up and catch me in my jammies. 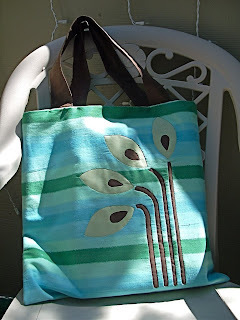 One of my favorite craft bloggers, Diane Gilleland aka Sister Diane of CraftyPod, has contributed a tutorial for this tote to the fabulous CraftStylish blog. 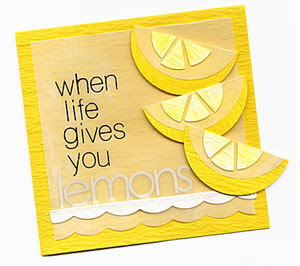 Diane's projects are always well written with step by step photo illustrations. She's also the author of DIY Alert, her blog about all the crafters and crafty stuff happening in Portland. You will wish to live here in Oregon! Marie Claire Maison magazine has a fantastic web site with more inspiration than I've seen in quite a long time. There are also decor and art videos, forums and blogs. I just clicked all over the header and sidebar sections. Visiting this site is a fun trip down a rabbit hole. I have not had luck with getting Marie Claire sites to work through Google translator except for the forums and some of the blogs. I keep Google translator open in a new tab so I can copy and paste the text I want translated. I really fell for this idea pictured below. The planks are drilled and stitched together with red string then mounted on metal sawhorses. It's the drilled and stitched wood idea that I like. Maybe it could work for room screens or a potting table outside stiched with colored, plastic covered wire. The translated text is below. It's not perfect. This table was designed last year at Christmas. 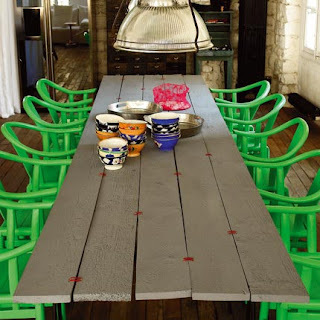 Believing that work in his Paris apartment would be completed, Paola Navone had invited about twenty people. But on December 23, the furniture had not arrived… In a few minutes, she had the idea to the table: she collected five boards that were hanging on site. After quickly painted grey, it has been trouer randomly and has sewn together with red string (BHV). She asked the board thus constituted three metal trestles. 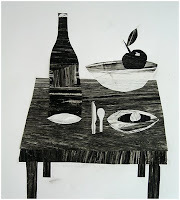 All that remained was to draw up a table… for the feast. There are projects, cards and ideas but it was the information about the qualities of the papers I found most interesting. Full facsimile copies of the Craftsman magazine edited by Gustav Stickley. Hosted at the Digital Library for the Decorative Arts and Material Culture at the University of Wisconsin. Reading these magazines gave me a good glimpse into the lifestyle and philosophy of the Craftsman movement. 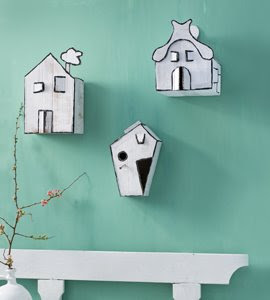 The magazines explore home and building, arts and crafts, gardening and landscaping. They contain patterns and plans for homes, furniture and decorative arts. This is a great idea for a group of kids. Make ice-cream in baggies.